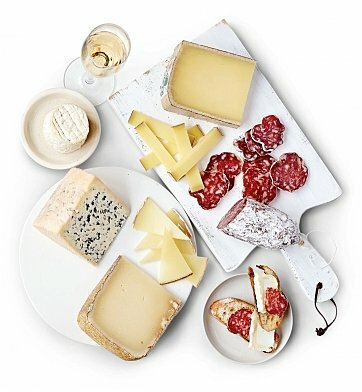 Relax in luxury with this spread of French cheeses and charcuterie that's nothing short of magnifique! Each artisanal cheese is cut-to-order by world-renowned Murray's cheese makers, gently wrapped in specialty paper and shipped with ice packs to preserve its perfectly cool condition. Presented in a rustic wooden crate, it's a gracious offering for those with excellent taste. Maroilles, a creamy, semi-soft cow's milk fromage from Northern France. Roquefort, arguable the worlds greatest blue, from caves in Southern France. Bucheron, a French goat cheese with an edible thick cream rind. Perfect Pairings! Try pairing the fare in this gift with a crisp, floral champagne, pinot noir or lush rose. if ordered by 5:00 am EDT Sunday April 28th. French Connection Gift is a hand delivered gift. These gifts are delivered by one of our local design centers located throughout the United States and Canada. Same day delivery is available for most gifts when ordered before the cutoff time. The cutoff time for French Connection Gift is 2 AM in the recipient's time zone. Is there anything more indulgent than a picnic in Paris?